Things are going to get a little heady when you delve into The Sound of Thunder, the new collaboration from Onewayness and dRachEmUsiK. How can they not, when the four long drone-based pieces here draw inspiration from T.S. Eliot’s “The Wasteland” and are crafted to reflect four virtues of the Hindu texts, the Upanishads–Charity, Mercy, Desire, and Peace. The artists note that “the movements are intended to represent the conflict and resolution between these virtues and the ‘undesirable’ qualities that they are meant to keep in check.” What flows from this starting point is a hypnotic blend of warbling electronics, textured drones, spoken word (from “Wasteland”), and “lowercase” minimalism–the use of small, amplified sound samples blended with spaces of quiet. Three of the four pieces begin on the challenging side of things. Dark and raspy hums of grinding electronics, dissonance, uncomfortable, croaking vocal samples–each track brings its own. And in time, each smooths out to become something new and lighter, having found that point of resolution. This is an hour-long voyage that wastes no time getting into your head. “In Charity” opens with wavering tremolo chords that quickly render into a hypnotic wave. There’s lowercase aspect here in the background, in the form of manipulated percussion sounds–they go off like tiny explosions. It’s fairly grim and challenging at the outset, but it’s so dynamic and has such presence that it holds the attention. But make no mistake, you get through the first few minutes. This track’s resolution comes with a chant-like line of sound for a slightly sacred edge as it draws to a close. The transition is excellent, and the way in which it releases the tension coming out of the darker sections is something you actively feel. This track also drops in the first “Datta. Dayadhvam. Damyata. Shantih. Shantih. Shantih.” from “Wasteland,” which will recur through the disc. “In Mercy,” which has the aforementioned dissonance and the creepy vocal sample looping through its strangled utterances over and over, holds on tightly to its disturbing aspects as a glitchy beat begins to work itself into the mix. The transition is hard-fought in this track, but eventually gives way to softer pads, a melodic line, and a light rhythm. “In Desire” takes the listener straight into the lowercase end of things. Here an electric piano drops single notes over snippets of processed voice, electronic crackles, and random noise. I like the solid recognizability of the piano against the more fleeting, abstract elements. Long pauses and hanging notes drive home an emotional core. It’s like being half-awake and not sure which side you’d rather be on. The phrase “strange beauty” would be fully applicable here. The transition here is perhaps my favorite, arriving on a percolating sequencer line loading in a little touch of lightness and energy. Also great that the electric piano doesn’t change its approach. It just keeps flicking out those single notes. The final track is the longest, and the one that subverts the standard equation. “In Peace” begins with big ambient pads, surprisingly soothing, and includes a fairly lengthy spoken passage from the “What the Thunder Said” section of the poem. (I must admit that listening to this disc and doing a bit of research brought me back to read “The Wasteland”–something I’ve undertaken in the past but not gotten through.) This track simply courses quietly along, taking the listener deeper into its calm motion. In places, bassy rumbles stir the flow. In the final minutes, I feel I must warn you, the narrating voice again returns to chant, “Datta…Shantih, Shantih, Shantih,” the arrival of which, lost as I was in the depths of this excellent piece, pretty much scared the shanti out of me. I’ve said a lot about this disc, more than I usually do, and that’s because there’s so much going on. These are depths to be plumbed in close listens. There’s a lot happening and a ton of feeling lacing through the mix. Onewayness and dRachEmUsiK (aka Adam Holquist and Charles Shriner) expertly manage this tenuous juggling act well, effecting the balance between easy and difficult listening. 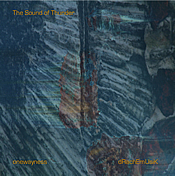 The Sound of Thunder is a disc you need to go into with an open mind. Do so, and it will likely win you over quickly. Available from the Onewayness web site. 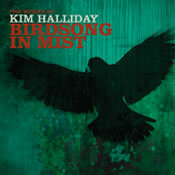 At the heart of Birdsong in Mist is Halliday’s splendid playing. His piano work runs deep with emotion; his use of the space between notes is potent. The range of instrumentation and breadth of style speaks to his talent. (In case you’re looking for a score for your next high-tension film scene, you’ll want to have a listen to the very dramatic “Victim Selection.”) What’s more, he crams these 15 fully realized vignettes into less than an hour’s time and nothing feels rushed or lacking. I’ve given Birdsongs in Mist a lot of listen-time since it arrived, and it just gets better the more and the deeper I listen. Available from Kim Halliday’s web site. 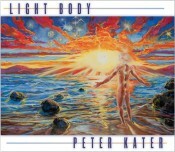 Peter Kater is a well-known quantity in the New Age scene, a platinum-selling, multiply Grammy-nominated pianist and composer with a prolific output over the course of 30 years in the business. Surprisingly, his new release, Light Body, is my first exposure to his music, although I have long been aware of the name. Not surprisingly, this first exposure has granted me a hefty dose of “Look what I’ve been missing.” Light Body is a beautiful set of seven pieces, each based on one of the body’s chakras, creating a suite that is relaxing and enlightening, romantic and descriptive. Kater’s piano most often takes the role of laying down a rich rhythmic bed, accented with light synthesizer work, as an accompaniment to Paul McCandless’ flowing brass and woodwinds. They are joined on several tracks by Trish Bowden’s gossamer, wordless vocals, and all the elements are gently mixed into one deliciously laid-back hour of listening. Kater starts from the bottom of the energy chain and works his way up, opening with the earthy “Root Chakra.” Field recordings of rainfall or wind whisper in the background. Choral pads–I don’t believe this is yet Bowden’s voice; it sounds like the familiar synth effect–float up to harmonize with Kater’s piano. This leads into “Sacral Chakra,” one of my favorite songs here. This is the first place where McCandless joins in, his sweet saxophone melodies lending a soft voice and (to this listener’s ears) a smoothness reminiscent of the Windham Hill sound–particularly over Kater’s crisp keys repeating an easy arpeggio. Bowden’s voice coos quietly in the background. Field recordings of children fold in briefly, a nice touch. McCandless carves hawk circles in the air on “Solar Plexus Chakra,” a piece filled with a joyous, vibrant energy. The pace slows for “Heart Chakra” as Kater lays down patient piano lines, letting McCandless fill the spaces between phrases. This piece has a deeply romantic classical-music feel and the simple intimacy of chamber music. Bowden lends an angelic touch. That overall sense carries into the relative hush of “Throat Chakra.” The start of “Intuitive Chakra” borders on ambient, with Kater laying down rising pads over light chimes. This piece has a nice misty air to it, and the space between piano notes feels even more pronounced. Pennywhistle and flourishing glissandi from the piano fly in to add something of a faerie-inspired touch. This one swells with a little extra romance, nudging the edge of being a trifle too bombastic. But it works. The disc closes with “Crown Chakra.” A super-high note draws your attention (and later peeks through the music in spots) before Kater and company begin laying out another quiet and soothing story. McCandless’ work again is sublime in its emotional depth, long notes hanging like dream-dust in the air, his wonderfully descriptive phrasing keeping you close. Light Body has already landed on a lot of “Best Of” Lists and is reaping its share of well-deserved notice and nominations. One can dispense with the healing-music trappings of having each track chakra-aligned–I know that can be off-putting to some. With or without that connotation, this album is a moving, straight-to-the-heart suite of absolutely beautiful songs. The minimal construction, with most tracks working in little more than piano, light synth backings, one or two instruments from McCandless, and Bowden’s almost imperceptible but quite palpable additions, give everything that distinctly intimate feel. This is a very personal album for any listener, nudging out soul-stirred responses. 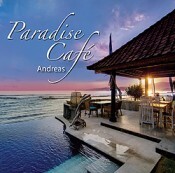 A lovely wind-down disc that has already gotten a lot of repeat play here at Hypnagogue. New Age fans need to hear this; people who think they aren’t New Age fans need to hear it more. Available from Peter Kater’s web site. 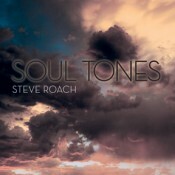 There is no hyperbole in saying that Soul Tones easily ranks among Steve Roach’s best quiet works. In two long-form pieces (45 and 28 minutes), Roach slowly spins out meditative ambient threads that wind their way around the listener. The deceptively simple rise-and-fall flows weave through one another in complex paths and patterns, rendering themselves into a signature sound-cocoon you won’t want to leave. There is little to effectively say about the work here other than that; the sound is perfectly immersive and calming, as soothing a piece of ambient as I’ve ever heard. As Roach did during the disc’s inception, I suggest you leave Soul Tones running for long stretches. It’s music that’s meant to be lived within. Personally, I’ve had it looping in headphones for up to four hours; the sound is internalized in short order and goes directly to its palliative work. Time and breathing slow; ease takes over. This is an ideal disc for meditation and sleep-listening. It has, for me, a distinct centering and cleansing quality to it. The last few minutes of “Resolved” are touching and moving in a way that I haven’t felt in much other ambient music. Soul Tones is the first in a planned set of three connected releases coming out over the next year; having delved deeply into this one on many occasions already, I am very much looking forward to what comes next. In the meantime, I will spend more time inside Soul Tones. Available from Steve Roach’s web site. It can also be streamed in its entirety at Bandcamp. Ambient music listeners should take it on faith that when they sit down to listen to something new from Igneous Flame they’ll be giving the next hour over entirely to being inside of and deeply examining the sound. On his latest outing, Pete Kelly “used some of the more ‘traditional’ instrumentation and sound sources that are commonly associated with ambient music in musically diverse and subtly different ways.” He also notes that he wanted to create an album that let him experiment beyond his “usual ways of working.” This is one of the things that has long endeared me to Kelly as an artist. He doesn’t rest. He doesn’t sit on a comfortable sound-set and reorder it. He challenges himself to reinvent Igneous Flame, even if it’s in a slight manner, each time out. 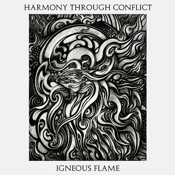 Harmony Through Conflict has distinct stages to it, from the kind of warm and far-reaching ambient pad work that forms the artist’s signature sound to borderline dark spaces. Kelly says he sees the work here as “heavy” rather than dark, and I’d agree with that. The further into the disc you get, the more he loads on a sort of emotional weightiness, a specific gravity of tone. Nothing here is truly without that tenuous sense. You hear it in the animalistic sounds lurking under the pads, watery burbles and light cave echoes of “We Remember.” It resides in the bass-drone underlay at the outset of “Electric Blue.” Kelly plays with vocal samples here, too, an interesting and unexpected touch that comes in at the end as he levels the sound out to a classic ambient wash. The lush tones of “Message to the Other Side” give off the first hint of a shift toward shadow. This easily ranks with my favorite Igneous tracks, 12 minutes of the warm depths of his sound, a nicely ominous tone laced throughout. Kelly knows how to sustain feeling with a minimal soundset; in places he pares it down to thin, almost solitary sounds. In contrast to denser moments, it almost creates a sense of isolation. This track gives way to the grinding open of “Phosphorescence” and the real start of the heavier side of the disc. The weight comes fully to bear on you in “Ray Four,” a piece that wends its way into a murky abstract form composed largely in uncomfortable whispers, thick, bass-rumble washes and guttural utterances. There are moments of breath-holding tension before Kelly releases the track with rising pads. He closes out by bringing a bit of light back around in “Bluebird.” Chimes and bass guitar lift their voices and move teasingly toward a melody that never quite flourishes. But the hope of it is enough, a sign that we’ve passed through. Harmony Through Conflict is another winner in the Igneous Flame stable. As Kelly suggests, this is very much a headphone listen. He’s a master craftsman with a strong focus on sound texture. The deeper you listen, the more your mind’s eye sees. Take the time to really focus on this disc. It’s worth it. 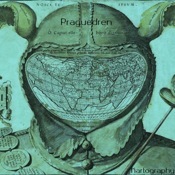 Misty drones and washes make up the majority of sounds on Kartography, a 30-minute ambient appetizer from the Czech duo Praguedren. Subtle field recordings and near-hidden bass drum pulses tucked into the flow add texture and a little aural interest. While the disc is quite listen-worthy, there’s not much variation as it goes along. Tones move in slow motion, following a rise-and-fall cadence, often bordering on white-noise softness. The only real shift here is felt in “Memory Map” as the duo rough up the edges a bit and drop in some disjointed soundbites for atmosphere. As I listened, it felt like some of the tracks fade out too soon. The endings feel arbitrary in spots, and it’s the quality of these pieces that make the early exit more noticeable. “Beyond the Edge of the World,” for example, is drifting along quite nicely for itself, buzzing drones working into your head, but then it seems to change its mind and just…stop. Kartography may have benefitted from having some if not all of the tracks quietly run together, making a smooth shift from one to the next, instead of pinching tracks off in what feels like mid-stride. For the short jaunt that it is, Kartography is a pleasant enough ride. It’s a soothing suite of pieces that take on extra depth in a headphone listen, and the softness of it overall lends itself to looping. Available in February from Dank Disk.